Following on from Finnair's new look Asian meal service, Delta passengers flying out of Asia with an eye for the authentic will soon feast on staples-turned-standouts like oven-baked sesame dumplings, kuro-buta pork and Bibimbap alongside other regionally sourced culinary centerpieces on select Delta flights. Beginning 1st March regionally inspired meals designed by Delta's new, exclusive culinary consulting partners and chefs Jereme Leung and Norio Ueno and will launch and pay respect to their Chinese and Japanese cultures so intimately steeped in food traditions. Starting this summer, Delta will also be partnering with Korean chef Woo-Joong Kwon to create regionally inspired meals for customers inflight. Chef Leung's menus will be available on Delta flights departing Beijing and Shanghai in Delta One, Delta Premium Select and Main Cabin, while Chef Ueno's menus will be served on all flights departing Japan for the U.S. in Delta One and Delta Premium Select, expanding to Main Cabin this summer. Chef Kwon's influence will be seen on flights out of Seoul to the U.S. in the Delta One, Delta Premium Select and Main Cabin. "Dining, no matter where you are, should be an experience that is enjoyed and remembered," said Allison Ausband, Senior Vice President — In-Flight Service. "Making sure the experience is as authentic to local culture as it is delicious is at the core of how we develop our in-flight menus, and why we wanted to partner with chefs Jereme Leung, Norio Ueno and Woo-Joong Kwon who are so well respected in their home countries." This is the latest in the Trump supporting airline's investments in the Asia-Pacific region where it has seen a steady increase in customer satisfaction as more Asia-based customers choose to fly Delta. Some of the investments include expanding its Asia-Pacific network, developing strong partnerships with important Asian carriers like China Eastern, China Southern and Korean Air, operating Delta's first Airbus A350s into Asian markets featuring the all-new Delta One suite product enhancement and Delta Premium Select cabin, upgrading complimentary economy cabin amenities like blankets, slippers and branded ice cream like Mangnum Bar, Ben & Jerry and Haagen Dazs, expanding fresh meal entrée offerings reflective of the local culture, launching Alessi serviceware for Delta to elevate the dining experience, expanding seatback entertainment systems with free entertainment, free mobile messaging, access to Wi-Fi on nearly all flights, noise-canceling LSTN headphones and more. Chef Leung, best known for deliciously blending modern Chinese cuisines with classical Chinese provincial food, has developed menus featuring highlights such as Shanghai style steamed sole fish, oven-baked sesame dumplings with preserve mustard, dim sum and shaanxi biang biang noodles, for service out of Chinese markets. 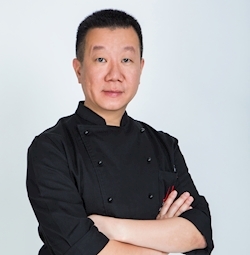 "I am looking forward to bringing some of my signature dishes and dining experience from our restaurants around the globe to our distinguished guests on Delta flights," Leung said. "Working with the Delta team to create their new Chinese cuisine offerings inspired by China's seasonality and many wonderful food options has been an amazing experience — I hope our guests enjoy these menus as much as I enjoyed designing them." At the same time, Chef Ueno's detailed and respected approach to prepare dishes will inspire favorites like marinated rockfish and saimaki shrimp with special egg yolk vinegar, and kuro-buta pork served with samed rice, Japanese pickles and miso soup on flights from Japan to the U.S.
"Considering the different environment and challenges in the air versus on the ground, we had to think a little differently to design the in-flight meals," Ueno said. "Though it was a challenge to recreate our delicate dishes, we managed to achieve a high-quality menu without compromising authentic Japanese food, and are very much looking forward to offering of menu onboard to Delta customers." Customers departing Korea for the U.S. will feel indulged knowing their menu has been directed by Kwon — a chef raised in a family of chefs whose Korean restaurant has earned two coveted Michelin stars. His dedication to bringing the authentic flavors of Korea using rare and precious seasonal ingredients with a contemporary twist will be highlighted in his dishes. "I am very excited about my in-flight collaboration with global premier airline Delta Air Lines," Kwon said. "I am looking forward to working with the Delta team to design inspirational and sumptuous Korean dishes using my original recipes and various seasonal ingredients for Delta customers to experience on routes from Korea to the U.S."
Delta will consult with all three chefs seasonally to refresh the offerings in each market. Each chef will also be traveling to the U.S. annually to meet on an ongoing basis with Delta and the airline's catering and restaurant partners to develop meal selections for flights departing the U.S. to their respective countries. Delta has a history of working with working chefs to bring local, seasonal flavors to the tray table. The airline has partnered with talent like James Beard honoree Linton Hopkins, select chefs from Danny Meyer's Union Square Hospitality Group, and most recently L.A.-based chef duo Jon Shook and Vinny Dotolo. The goal is always the same: translate fresh ideas about regionally authentic food into a surprisingly second-to-none dining experience in the sky.